There’s almost nothing worse than “flubbing” a pitch shot. And often when we practice our pitching we are trying to hit one good shot after another. We’re searching for consistency in other words. 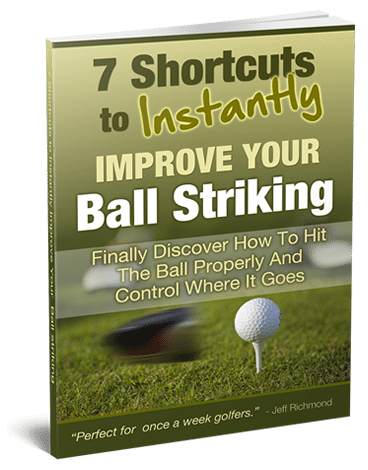 But so much of golf improvement is counter-intuitive, and this new tip today definitely is… However, ironically, if you do it you will become a better and more consistent pitcher. The next time you go and practice your pitching I don’t want you to try to hit one good shot after another with the same trajectory. Instead, every shot I want you to alter something to get a different trajectory on the shot. So let’s say you’re practicing a 50 yard pitch shot. I want you to play the shot with 4 different trajectories. The first one is super low. When you play this shot right the ball flies low, bounces a couple of times and spins to a stop. To play that shot play the ball back in your stance, have your hands forward at address and then keep the follow-through short so you hit a punch pitch. up and down at address. Then make a similar swing back and through. longer and smoother to get the ball up in the air more than normal. make a big, fast swing. So there you go. 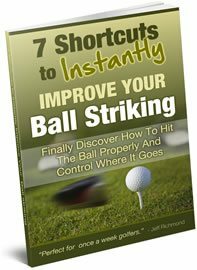 That’s 4 shots to practice that will improve your pitching consistency. You may think that this is too difficult because you can’t even master one basic pitch shot. That’s where the counter-intuitive part of golf improvement comes in. to do random things with it. If you try and do the same swing over and over again you’ll often won’t get any better and often will get worse. So the next time you practice your pitching go out there and mix up your shots. Try and do a different trajectory for each shot and watch your control of the club improve and your scores will go down the more you do this. Anyway, that’s my new, fresh tip for you today. Enjoy trying that out and let me know how you get on.